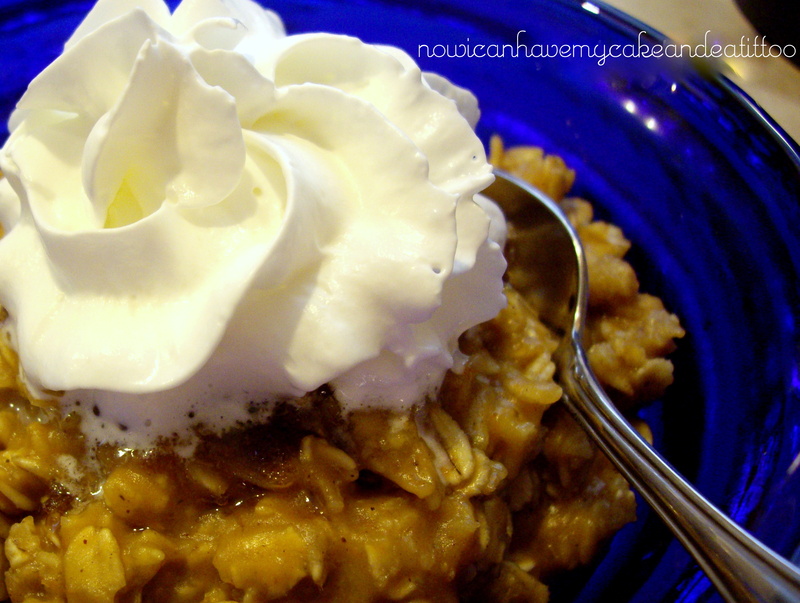 oatmeal – Now I Can Have My Cake And Eat It, Too! Add THM brown sugar and pumpkin to a medium saucepan and begin to heat over med-high heat. Add almond milk and slowly stir into pumpkin and THM brown sugar. Now add vanilla, pumpkin pie spice and salt. Bring everything to a gentle boil; stir in oatmeal. Reduce heat and simmer about 4 minutes or until oatmeal is soft and creamy. Serve in a pretty bowl with a little whipped topping and enjoy! This pumpkin pie oatmeal is a delicious ‘E’ breakfast for my THM friends… so if you want whipped topping on it, be sure to use just a tad, or use fat-free! There are few things that feel like comfort food to me more than warm oatmeal. Now, normally I would add tons of brown sugar and raisins to my oatmeal, but now that I am a Trim Healthy Mama, or on my way to being one anyway, I no longer use brown sugar OR raisins, as they are not conducive to weight-loss. 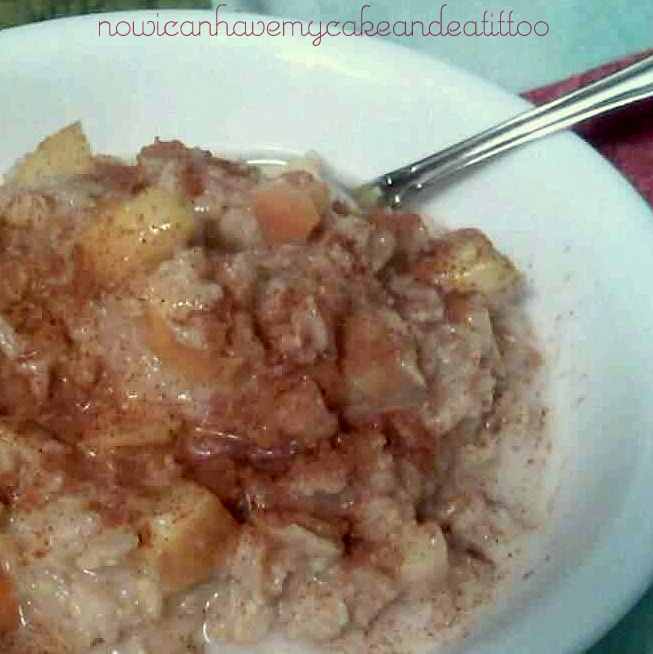 So I got creative and made this… it’s apple cinnamon oatmeal. Apples, and cinnamon are a great combination. Add them to creamy, warm oatmeal and it’s a match made in heaven…And it’s perfect for this time of year! Just look how yummy this looks! In a medium size sauce pan, bring 2 c. water to a boil. While waiting wash your apple well and dice. Once water is boiling, add oats to water and boil about 1 minute. Add diced apple and sweetener; continue boiling apples and oats for another 4 minutes or so. Once apples and oats are done, take off heat and spoon into bowls. Pour desired amount of almond milk over oats and sprinkle with cinnamon. This will serve 2 people. Notes: You could do this with any fruit…peaches, pears, blueberries. Adjust cooking time accordingly. The oats still need 5 minutes, just add fruit in later…for all my THM’s out there, this is a fabulous ‘E’ breakfast (lunch or dinner works, too)! I really hope y’all will try this, it’s sooo good and perfect for this time of year! So glad I decided to try this for my first ‘E’ meal!! It was fantastic! I did tweak the recipe a bit, so I will share the tweaked recipe with y’all. It was so thick and rich, with a deep chocolate flavor… PERFECT! Put 1 c. water in a medium size saucepan and heat over medium-high heat; bring to a boil. Once boiling, add oats and sea salt; reduce heat to low and simmer for 5 minutes. While oats are cooking, put remaining ingredients, except peanut butter, in the pitcher of your blender; blend for a couple minutes, scraping the sides of your blender pitcher as needed. Once oats are done, remove them from heat and pour contents of pitcher into saucepan; stir well. Stir peanut butter into oats pour into a pretty bowl to enjoy! Feel free to follow the original recipe if you wish, it’s page 232 in the book. It was perfect the way I made it. The texture was great! Thick and creamy and Oh so chocolaty!! 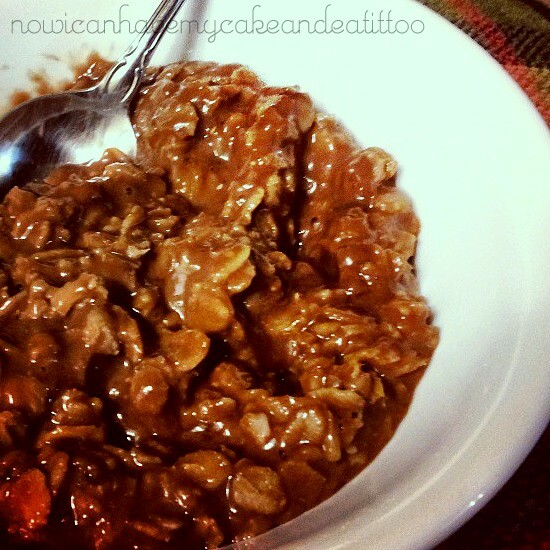 ChocoCookie Bowl Oatmeal is a delightful E meal, so be sure to keep your fat to 5g or less with this meal!